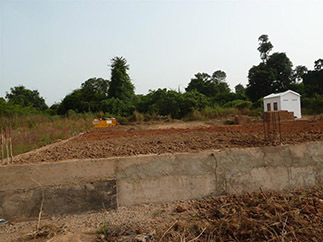 The start-up of a new cashew processing center in Bissorã is one of the key pieces of the project "Process and commercialization of cashews", funded by the European Union, that ADPP-Guinea-Bissau, a local partner of the Foundation, is carrying out. This initiative, which works directly with 2,720 farmers, aims to reduce chronic food insecurity by improving the production, transformation and sale of this fruit. It is one of the development actions promoted by Humana to increase the income of the communities, in this case of this town of Guinea-Bissau. ADPP-Guinea-Bissau implements the Farmers Club program in order to organize and train sustainable agriculture techniques to farmers and the involved farmers. The objective: to increase food security and help reduce poverty in rural areas. Just over a year ago, Bissora started this Farmers Club project focusing on the production and marketing of cashews. It is based on the creation of two cooperatives for the sale of this fruit and two processing centers (one cashew nuts and one cashew nuts). In addition, 2,720 farmers and 40 young students of the Bissora Professional School have been trained in techniques for improving production and productivity, maintenance of the processing facilities themselves and of the electric generating equipment and photovoltaic panels. The new processing center has three rooms, dedicated to fruit, nuts and pulp, respectively, as well as two processing units, one for the dried fruit and one for the pulp. Once the processing center and the cooperatives, the project team and the farmers involved are underway, will develop a management system in order to achieve the maximum benefit for the community.